Home / News / New Soul Snatchers album is out now! – Where Y’At? 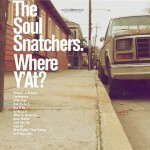 Previous post: Pre-order the new Soul Snatchers album – Where Y’At?